The Switch SUPERNAP campus in Las Vegas has it all: massive scale, impressive connectivity, extreme density, technology innovation, distinctive design and a powerful convergence of cloud computing companies. That’s why the three huge data center buildings on the main SUPERNAP campus have attracted a critical mass of more than 1,000 customers, including 120 cloud and managed service specialists and 50 telecom providers. Switch has built upon its sweet spot in Vegas, where it now houses 1.4 million square feet of mission-critical space across SUPERNAPS 7, 8 and 9. At full build-out, the Vegas campus will support 280 megawatts of IT capacity. It is an example of how the cloud campus is enabling powerful Internet growth in multi-tenant data centers as well as hyperscale facilities. Cloud campuses are multi-building data center developments offer economies of scale, enabling companies to rapidly add server capacity and electric power as more workloads shift from in-house IT rooms into these massive server farms. Although the concept was popularized by companies like Google and Facebook that have built huge data hubs in rural areas, the cloud campus can also thrive in Las Vegas, where Switch is playing a leading role in establishing the benefits of scale and density. Now Switch is ready to bring the SUPERNAP model to new markets. Earlier this year Switch announced an expansion in Reno, were it has begun construction on a 1.2 million square foot data center building that will serve as the anchor for an even larger multi-building campus. Meanwhile, SUPERNAP International has announced the first step in its global expansion with a data center project in Milan, Italy. Although its primary business is colocation, Switch has become an increasingly important player in cloud computing, with more than 120 cloud or managed service providers as customers. Jason Mendenhall, the executive vice president for cloud at Switch, says the SUPERNAP offers excellent economics for cloud customers and providers because of its connectivity and ability to host ultra high-density racks of equipment. The SUPERNAPS are designed to handle power densities of 30kW per rack and beyond, which allows cloud providers to pack more gear into their colo space. The growing ecosystem of cloud-centric companies and customers on the SUPERNAP campus is creating a network effect, reinforcing the value proposition, Mendenhall says. The Switch cloud team has taken an active role in guiding the development of that ecosystem, helping customers find providers, and helping providers find partners. “We are, in essence, playing the eHarmony of the data center, and helping customers sort out which solutions work best for them,” said Mendenhall. The original SUPERNAP is an expression of an alternate vision of high-density data center design developed by Rob Roy, Switch’s founder and CEO. Built in 2007, the 400,000 square foot data center was most notable for its enormous size, but also showcased new ideas in cooling and aisle containment that Roy developed as he filled six smaller data centers in Las Vegas between 2000 and 2006. Inside the data hall, Roy’s design for a hot aisle containment system enabled customers to support up to 1,500 watts per square foot (the chief density metric at the time). Outside the data center, Roy’s custom cooling units supported four different modes of cooling, switching to the most efficient mode to adapt to changes in the weather. In 2013, with the SUPERNAP filling and more demand in the pipeline, Switch built a second huge building next to the original SUPERNAP (now called SUPERNAP 7). The new SuperNAP 8 was built with pre-fabricated modular components, and designed to operate effectively in any climate, providing a optimized design template for global growth. Roy has described it as the “end game” for his vision for a versatile, scalable design. New wrinkles at SUPERNAP 8 include the Rotofly, an expanded version of its multi-mode HVAC unit that incorporates a flywheel to provide emergency “ride-through” backup power during a power loss. SuperNAP 8 also includes Switch SHIELD, a redundant roofing system that offers two steel decks (each rated to survive winds of up to 200 MPH), and a temperature control system known as Iron Black Forest, a steel framework that functions as a thermal storage system during outages. The convergence of cloud providers at the SUPERNAP Vegas campus includes Joyent, ProfitBricks, Virtustream, Salesforce, Intuit, CenturyLink, Citrix and Box, among many others. Switch also has a direct connection to Amazon Web Services for the many customers that make use of AWS. Yet selecting a cloud provider continues to be a complex process for many users. That’s led to an evolution of how Switch works with providers and customers. Customers interested in a particular service can sometimes take advantage of the technology testbeds that reside at the SUPERNAP, which is home to a research and development facility for the Cloud Native Computing Foundation, a coalition that aims to drive the adoption of a new set of common container technologies for Internet-scale computing. The campus also hosts a 24-petabyte Hadoop cluster operated by EMC and an Intel/UNLV supercomputer doing research in high performance computing. “If anyone is contemplating HPC in the enterprise, we have a platform where they can test it out,” said Mendenhall. 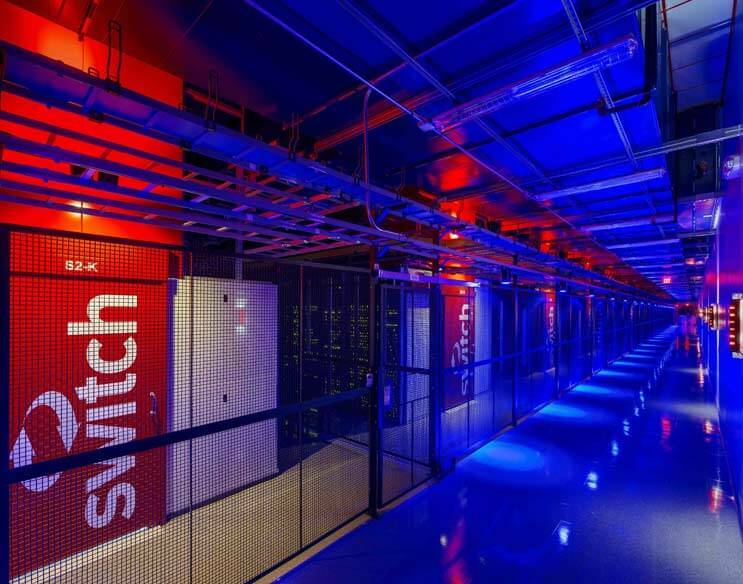 Switch is quickly populating SUPERNAP 9, a 500,000 square foot data center which opened its doors in August with the 120,000 square foot first phase sold out. The company isn’t done building in Las Vegas, where it is making preparations to build two more data center buildings, SUPERNAP 10 and SUPERNAP 11. After years of scouting potential new markets and perfecting its “build once, run anywhere” data center design, Switch is now ready to push into new geographies. The first SUPERNAP International project will be a 40 megawatt facility in Milan. The city in northern Italy is a key hub for business and finance (as well as fashion), but is served primarily by local data center providers. Switch’s largest expansion is slated for Reno, where it broke ground in August on a 1.2 million square foot data center, in which eBay will serve as anchor tenant. The company envisions up to seven huge SUPERNAP facilities on the site at the Tahoe Reno Industrial Park, with a potential total of 6.4 million square feet of data center space at full build-out, which would make it easily the largest data center campus in the world.